When we last saw Josie Schuller, she had her hands full disposing of a dead body deep in the woods. Someone pulls up in a car capturing her in its headlights. An old friend from her past emerges and wants to lend a hand. It seems, in Lady Killer #2, he's not the only one interested in the housewife and secret assassin for hire. It hasn't been easy for Josie since she became an independent contractor. Freedom has brought with it a lot of responsibility. She has to find her own gigs, not always the most prestigious or high paying, and clean-up is all on her. She perseveres nonetheless, also leading a double life of a loyal housewife and mother. A disapproving mother-in-law who knows her secret can be awkward. It's a lot different than when she was working for the agency. Her old mentor, Irving, could be a big help in her new venture, he insists on it. It seems retirement doesn't agree with him but cleaning up Josie's kills is his idea of relaxation. Considering Josie's dangerous line of work the appearance of Irving can be a little unsettling. It's exactly what writer and artist Joelle Jones wants you to feel. When "Uncle Irving" shows up unannounced at her husband's Christmas beach party, you get the eerie feeling that something is amiss as he tries to inject himself into her life. There isn't a lot of action in the issue but Jones keeps things intriguing when she introduces us to another player in need of Josie's services. A stranger seeks to recruit her to join his organization but naturally, Josie is suspicious. In the murder business, it must be hard to trust anyone especially since your last employer wanted to see you dead. Jones is putting these new characters in play, setting up some potentially lethal new circumstances that Josie will undoubtedly have to fight through. It's a meticulous and deliberate narrative, you can almost sense Jones tightening the noose around our neck, the strands of the rope grazing our skin, before without warning dropping the floor underneath us. That's what we have to look forward to in the coming issues. As if weaving a treacherous new chapter in the exciting black comedy saga of 'Lady Killer' wasn't enough, she's back doing incredible art. Michelle Madsen handles the color work and the two bring to life a vivid 1960's Florida complete with detailed beach scenes, a bingo hall, and period-appropriate airline attire. Jones has been one of my favorite artists and this issue demonstrates why. From character designs to backgrounds to body language to layouts there's nothing she can't do. 'Lady Killer' continues to build on Josie's new life in Florida. A new alliance, a possible new affiliation, and certainly more kills to come. This issue was light on the blood and gore but some interesting new developments mean the next issue can't come soon enough. Josie is finding her stride with a little help from Irving. 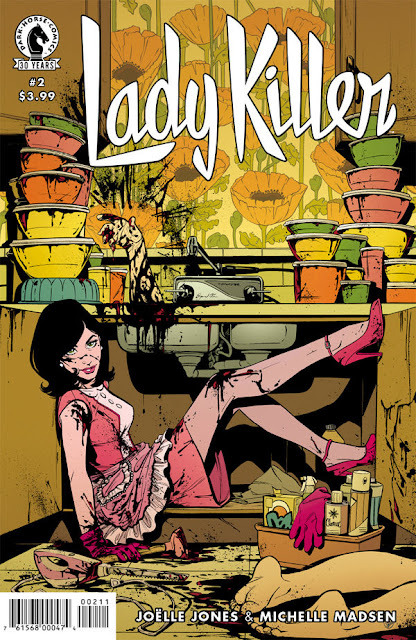 'Lady Killer' is deliciously dark and beautiful. Huh, never heard of this graphic novel. I added it to my to be read list.